-Colin is a Podcasting Trainer/Coach and he shares in the article “The Hardest Thing to Teach is How to create great Content. His NEW clients spend 50 minutes talking about microphones and mixers, and only 10 minutes talking about the content of their show. We all know content is the most important aspect, and yet it’s still the most neglected component when we think about planning. Even when we can get clients thinking about content, they tend to skip right to the topics that interest them, rather than thinking ‘audience first’. Web console for Spreaker . . . can it be made like app in that you can have a second microphone channel using V.B. cables so that you can bring someone in from Skype separate from you on your microphone through Skype? I normally use the desktop app, but will need to use the web console at some point in a month or so. 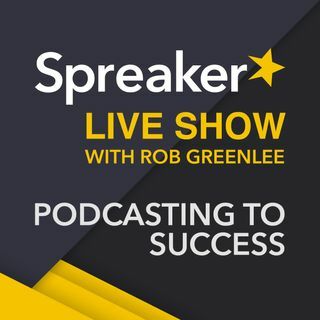 -We chat about the new Spreaker Shared Revenue Monetization tools we just launched. -We also get current on the progress of the new CMS system Spreaker is building? -Migration of setting controls.. what should we expect? Interview with Spreaker CEO, Francesco Baschieri about Ad Revenue Sharing and the New CMS Tools. HaPPY! hAPPY! 100! Here's to another 100! Thank you for having this for all of us! Thank you for all you contributions to the show and helping other Spreaker users with your questions and comments, Linda! Looking forward to new CMS . . . thank you, Rob, Alex and Francesco! Yes, it is a big security concern and performance is not reliable and uses a huge amount of computer resources to run. Flash is going to be going away altogether soon, isn't it? Yes, we just felt the need to move on as the web console uses Flash and that does not work on mobile devices. Oh and happy #100!!! Spreaker is the best!!! I had never used the web console, but took a look at it and discovered it does not have the same bells and whistles. Correct. Three or four hour taking turns from one location. Yes, normally use the desk top studio app. We are doing an Olympics marathon where we all have to sign into one console in turns. We will talk about you soon. I just use a $25 Logitech web-cam and Audacity to pre-record comedy stuff. Use the same thing with Skype for guests on the studio app. You will need a cave headlight for that. I will have to take my flash light and go into the SLS basement and check those out.